Have you ever wondered how to shop in thrift stores? More than likely, you aren’t alone in that thought and question! Don’t let the thrift store term scare you, because I am here to tell you that spending your money wisely in decorating your home can have huge payoffs! I’ve always loved the thrill of the hunt in thrift stores, and in saving money by shopping for certain items I have more cash for other things. High-end things! I’ve been shopping in thrift stores since college days. And between me and you, I have no intention of stopping anytime soon! Back in the day, there wasn’t a ton of money sitting around to buy brand new things. Money wasn’t available for me to buy anything new for my little apartment (or clothing). But thrifting was something that I have always loved. I have proudly passed this method of shopping on to my daughters:-). Admittedly I don’t go thrifting for clothing any longer but the girls do and have found some incredible name brand deals! 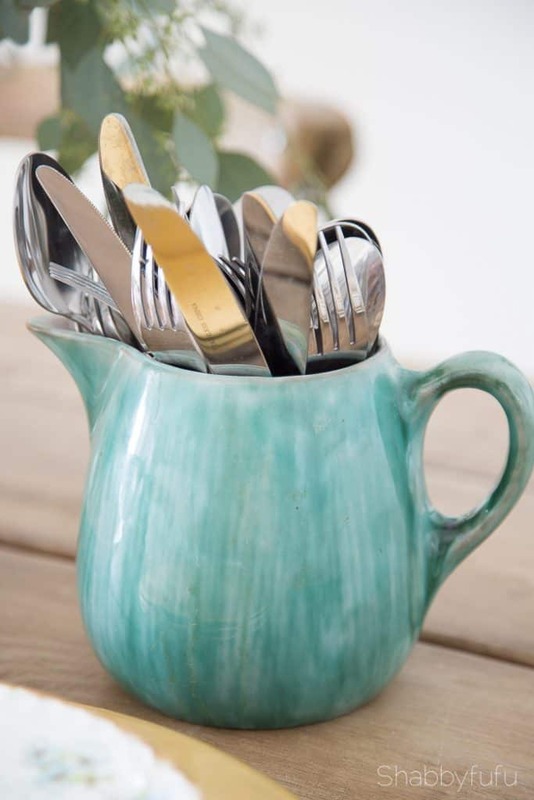 Here is a quick overview of what are the most abundant and best things to shop for in thrift stores for your beautiful home. Tips and tricks for thrift store shopping included! 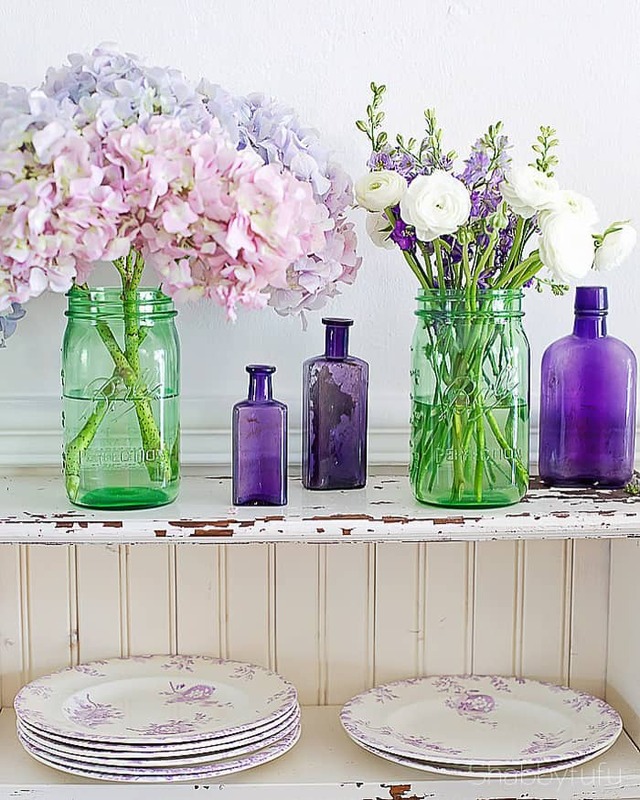 Trust me, you’ll love these tips on how to shop in thrift stores! 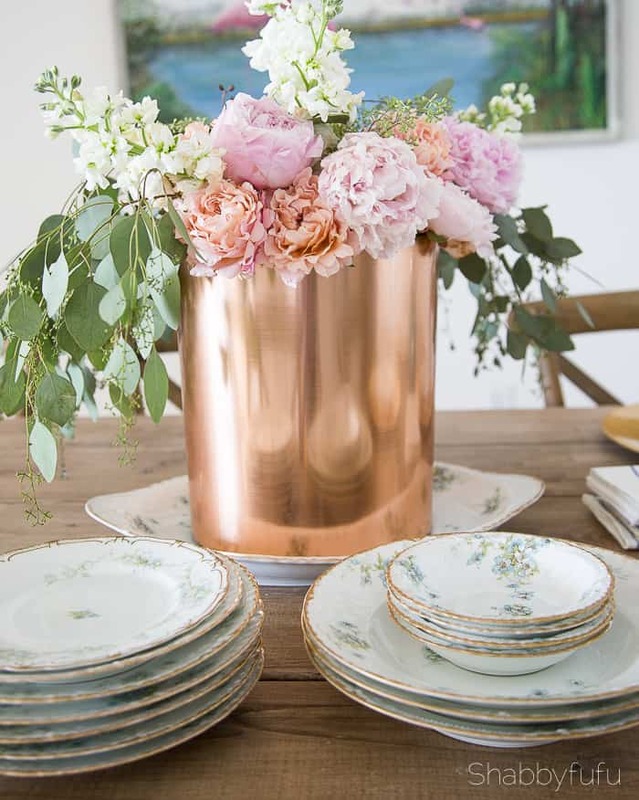 I not only love to create a beautiful home, but I love to design an elegant table setting as well! Head for the dishes when you are shopping and you are sure to find lots of choices. Something that you’ll almost always find in your local thrift store is white dinnerware pieces. Keep in mind that you don’t need an entire set for a tablescape. Mix and mingle is my mantra when it comes to table setting and that goes for pattern and color as well. 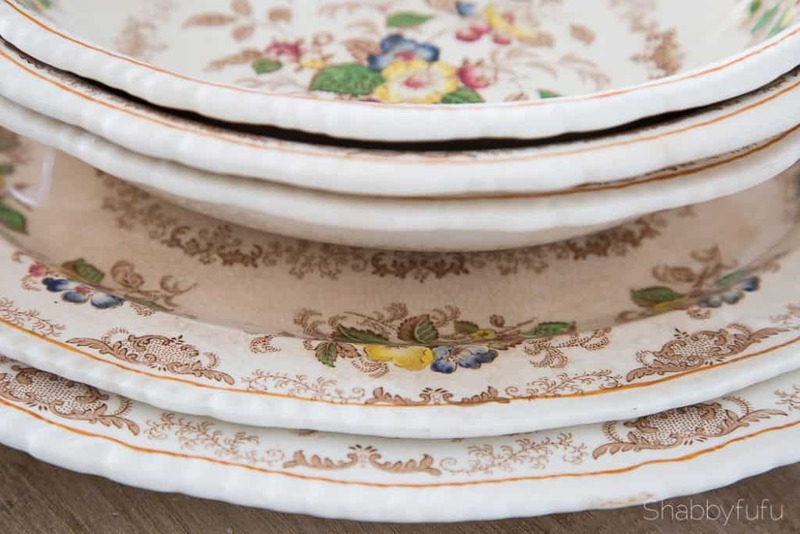 I’ve had my eyes on this antique Haviland Limoges in my favorite thrift store for several months, but the price was way more than I was willing to spend for a partial set. I pop in often, so when the thrift shop had 50% off all items this weekend I was thrilled to buy it! Talk about a steal of a deal! Most items that are well priced, to begin with at thrifts and sell very quickly, but I have learned over the years that when items are overpriced they generally do not. If you feel that is the case with something that you covet, wait it out and see if it eventually is on sale. Most thrift stores have sales every day, so ask at the front desk when you walk in. Above is the set of Haviland Limoges china that I picked up this past weekend and there are a few more pieces not showing here. Good things in thrift stores are still there if you keep looking and shop often! Thrift stores sell what is donated to them and the furniture is generally bountiful. My beloved white button tufted French sofa (below) was found at a thrift shop years ago. My friend and I were so thankful to have her pick up truck that day! When shopping for furniture you can find a mix of brand new that is usually store overstock and used. For soft goods, I get down and smell the furniture and check for tears. If you are planning on cleaning it and not recovering you’ll want to be sure that there is no smell of animal urine which I’ve found close to impossible to get out. In the case of my sofa, the fabric was too worn to keep, so for the price of just $150 I knew that I could recover it professionally and still come out a winner. Look for tables too and repurpose with paint. Paint can be a lifesaver for furniture! If you are looking for furniture and heading out to do the thrift store circuit, take an SUV or pick-up truck. If you don’t have one, grab a friend who has one of those vehicles for a day of fun! Artwork and wall decor such as mirrors are generally stacked in the corner towards the back of most thrift stores. Don’t ask me why because I don’t know, but that seems to be the case! I’ve found some amazing mirrors and my daughters have found framed art pieces and the prices are generally low. 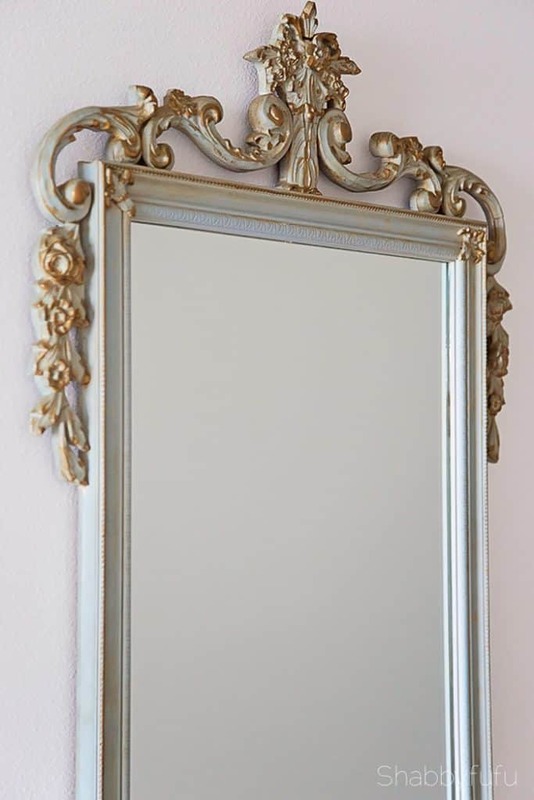 Don’t forget that mirrors can be painted and frames can be pulled off and repurposed from art to use in other projects. Check back often because merchandise is put out several times a day, if not more! People have discovered the joys of shopping at realistic price points and merchandise tends to move much faster than at antique or vintage shops. Yes…thrift store finds people! 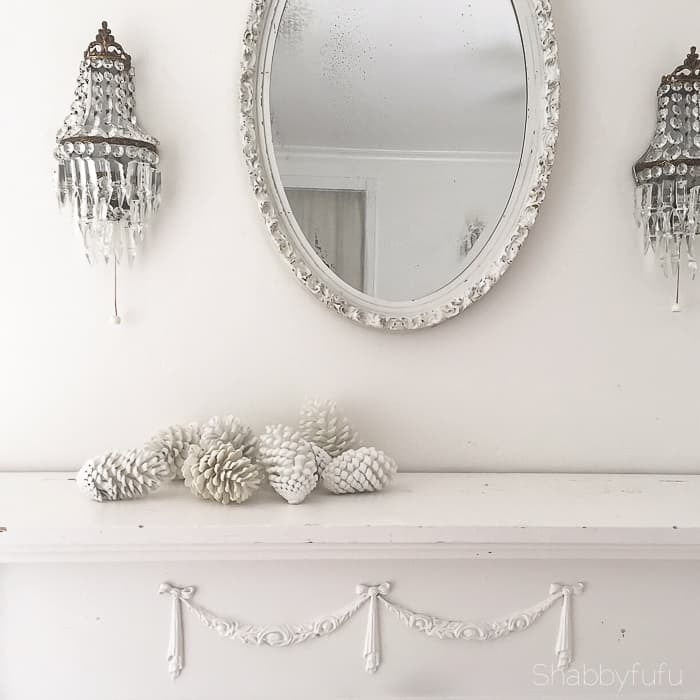 I did repaint the above mirror white. 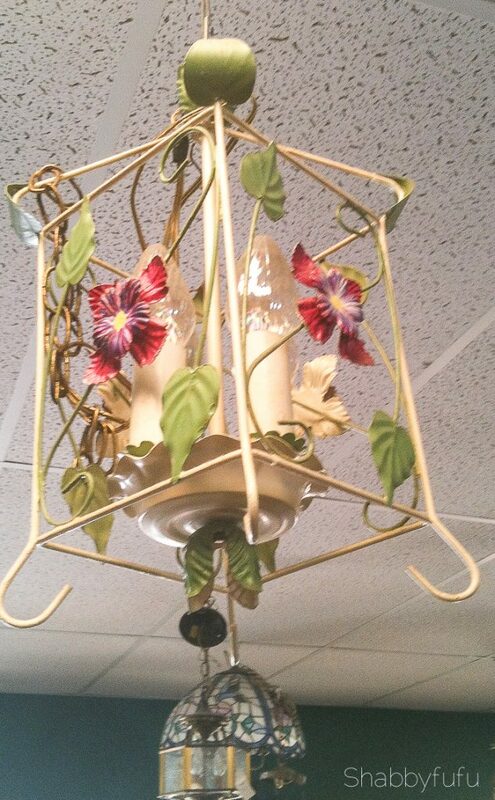 Much of the lighting in both of our homes are vintage and found at either thrift stores or yard sales. Don’t forget to look up, as chandeliers are generally hooked to the ceiling. Look for lamps in pairs and lampshades that can all be repurposed or made into a fun DIY project. Please check the wiring for safety, especially if you find a vintage piece. I would recommend rewiring anything vintage and if you aren’t comfortable doing that yourself take it to a shop that can do it for you. Up above…shopping at a local thrift recently. Don’t forget to look up! We all need more storage! Baskets are always plentiful at thrift shops. Spruce them up with paint and use them for magazine storage or hang onto them for use during the holidays to create a gift basket that can be personalized for friends. 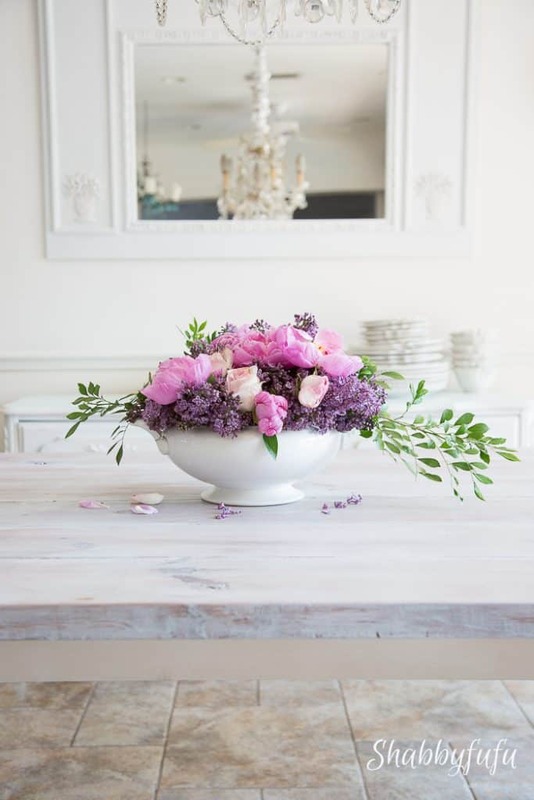 I also love to display flowers in baskets, whether dried florals, silk or fresh in jars. 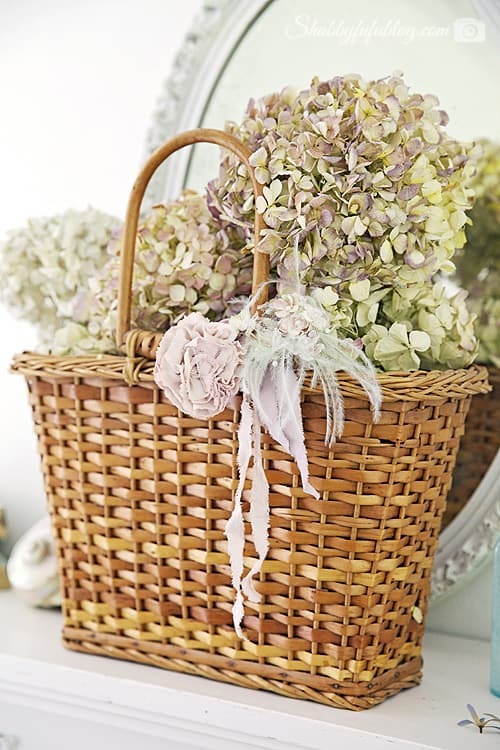 Look for baskets in good shape in a variety of materials such as wicker, wood, or metal. Skip the plastic and think about going more elegant and sprucing up with spray paint. You can never go wrong when shopping at thrift stores and even if you don’t see anything that speaks to you, head on over to the book section and scoop up a couple of novels or perhaps a Martha Stewart book! Thanks for the tips 🙂 I love going thrift store shopping as it is always such an adventure. I am fortunate to volunteer at our church thrift store which supports our food bank. Not only do I help those less fortunate than myself but also feed my own thrift store addiction. Just redid our powder room and found the perfect mirror for over the new vanity. Even my husband was impressed. I am always bringing home some treasure I find for my own home or my daughter’s houses. Such fun. Church thrifts are wonderful, good finds and great support system too! I have a favorite consignment shop I go to….the items are juried and come with great prices. Antiques, vintage and beautiful furnishings all displayed beautifully….I go there when I am in the area and have come home with lots of treasures…like my 1850 Louis XVI mirror for a fabulous price! I recently went to our local Habitat and noticed that antiques, etc that come in are now in an area for a “silent auction”…now that’s not fun! Have a great week Janet! I’m off the next two days (my first pair off since early November) and may just have to hit a thrift store or two! Thanks for the inspiration. Much appreciated Daisy…enjoy your week! I’ve donated many dishes and it justifies me picking up more that way. Haha! Enjoy your day Cecelia! I was told that one should offer 10% less than the marked price at thrift stores. What is your view on this? Thanks for the tips and for your answer!